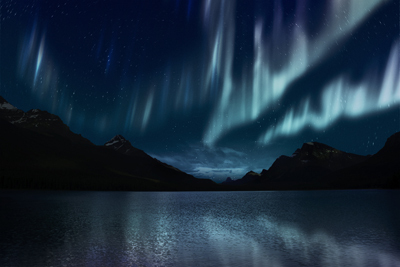 In this tutorial you will be learning how to create an aurora Borealis over a lake effect. Find an image of a nighttime landscape that has an open sky and large lake. Here we will be using one that has a mountain rage as well. Extract the sky from the landscape using your choice of extraction method. Under your landscape layer, create a Color Fill layer and and set it to a dark night sky blue (#02133e). Create a new layer above the color fill layer and set it to “Soft light”. With a very large soft brush set to white paint towards the bottom of the layer to create a gradient effect. Bring the layer opacity down to 20%. To create the streaks in the sky we are going to use the Paint Brush tool and Motion Blur filter. Create a new layer above the last layer you created and with a small soft round brush paint a white slightly squiggly line in the sky. Now go to Filter > Blur > Motion Blur and apply a large blur amount (100-400) and set the angle to 90 degrees. Name this layer “aurora”. Add a layer mask to the aurora layer and with a large round soft brush, mask out the top part of your aurora so there is no harsh line/edge on top. Reset the color palette (D), and create a new layer as “right-rays”. Fill in White, and then go to Filter > Render > Fibers. Apply these settings – Variance: 15; Strength: 4. Next, go to Filter > Blur > Gaussian Blur. Set Radius at 5 pixels. Then, go to Filter > Blur > Motion Blur. Set Distance at 235 pixels. Change Blend mode to “Screen”. Transform this layer so effect fits the image’s perspective. Merge “right” and “right-rays” together. When merged, the Blend mode of the new layer will return to “Normal” resulting in the reappearance of the dark, black areas. Just set the Blend mode back to “Screen”. … and mask it away. When complete, duplicate the layer a few times and merge them together for increased opacity. For “left”, I applied the methods similar to “right, but created larger gaps on my Filter layer (see below steps 3 to 5). Once I’ve merged my “left” and “left-rays” layers, I further tweaked my settings at “Levels” for a softer look (see step 6). Once done, we can merge all 3 layers “left”, “middle”, and “right” together. Rename it as “aurora”. Again, set the Blend mode back to “Screen”. Next up, applying colors to the aurora. Next, apply Filter > Blur > Gaussian Blur. Then, change its Blend mode to “Overlay”, and set opacity to 80%. Create reflections on the lake. Duplicate “aurora”, flip it, and give it a little perspective. Set opacity to 40%. Duplicate “color”, flip it. Erase those areas that touched the mountains. Set opacity to 65%. In my final image, I’ve altered the contrasts and hues of the image, and strengthened the shine of the stars. For an extra touch, I’ve added some clouds at the center to enhance the overall look and feel of the image.